Relaxed, contemplative and stocked with over a century’s worth of rare whiskies. You couldn't ask for a more fitting atmosphere for the Old & Rare Whisky Show, writes Felipe Schrieberg. It was not immediately obvious that the Grand Central Hotel in Glasgow had been elevated into a Mecca for whisky collectors. 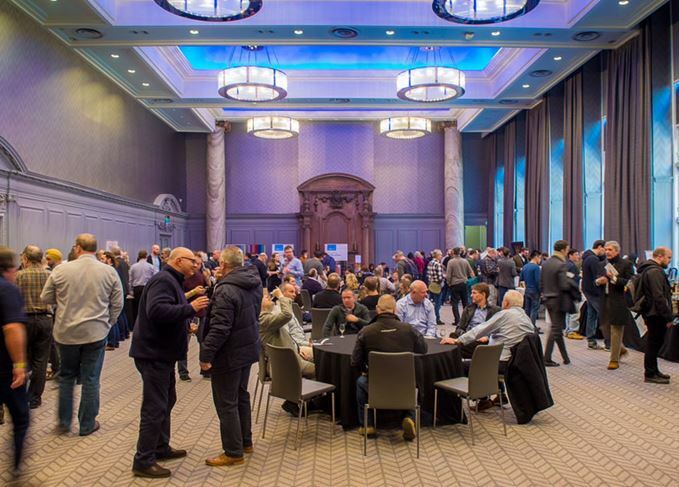 Still less obvious because as I entered its large conference room on Sunday (25 February), the first thing I noticed about the Whisky Show: Old & Rare festival, was its unusual noise – or lack thereof. Voices never went beyond a low hum of constant murmuring and quiet conversation. You didn’t need to fight to make yourself heard despite the crowd. In fact, the two-day Old & Rare didn’t really suffer from crowds as such. The space easily handled the 300 ticket holders each day, evenly spread among masterclasses, exhibitor stands, and a multitude of tables and couches where many sat with friends or on their own, their expressions reflecting deep contemplation of the drams in their hands. Given that whisky festivals generally feature swarms of attendees rushing from stall to stall, the slower rhythm here stood out. Then, of course, there was the Old & Rare’s celebrated whisky selection, which comprised some of the rarest gems to be found anywhere on the planet. Masterclasses included a celebration of Samaroli whisky bottlings, and the chance to try the very first cask bottled by the SMWS – the legendary 1.1. Throughout the exhibition stalls, there was an even selection of whiskies bottled literally over every decade all the way back until the 1930s, and a few bottles even older than that. An entire century of whisky making, just a sip away. That rare treat was afforded not only by exhibitors with access to choice drams, such as Diageo and the festival’s organiser The Whisky Exchange, but also by a heavy auctioneer presence and a few private collectors – including fellow festival organisers Angus MacRaild and Jonny Mcmillan – all showcasing extremely rare whiskies at their stalls. Having these unique historical drams served in this intimate atmosphere offered a pointed contrast to another much larger festival also known for its valuable whiskies – and as well for its massive crowds: the Limburg Whisky Fair. Throughout the day, this comparison was made time and again by the festival staff. The large number of stalls run by auctioneers and collectors also served as a reminder of the ever-faster evolution of the tight-knit community of whisky aficionados. Through the proliferating number of internet auction sites and tasting note apps, more consumers are aware of these rare bottles and buying more of them. Last year, the rare whisky auction sales in the UK broke the £25 million mark, and the market looks set to keep growing. While it’s impossible to taste all these whiskies (maybe one day in heaven as an angel taking its share…), the Old & Rare festival grants the privilege of sampling whiskies collectors are aware of but often not able to get their hands on. Hence, they travel from afar to this festival, extremely grateful for the opportunities it offers. Based on the whiskies I sampled, I can understand the drive to make the Old & Rare a pilgrimage-of-choice for collectors. Some of the standouts I enjoyed included a 42-year-old BenRiach boasting an aroma of marijuana, a 27-year-old Laphroaig bottled by the Syndicate, and an unbelievably fruity single Sherry cask of 20-something-year-old Cadenhead Clynelish. A particular festival favourite was an 18-year-old Ardbeg bottled before my parents were born. For £200 to try 10 millilitres, I saw more than few fans laying down wads of £50 notes to taste this unique piece of whisky history while Billy Abbott from The Whisky Exchange proudly displayed its cork, which looked like a shrivelled mushroom. He has every right to be proud, especially as he has enabled Scotch whisky fans around the world to enjoy and taste a piece of its history, in Scotland. The only downside of the event: the two-course lunch included in the price of the ticket. The lasagne was bland, mushy, and sad. This was a shame, as other whisky festivals do some innovative pairing with food or sometimes bring in unique catering. That said, it’s a quibble. Lasagne aside, the many smiling faces throughout the day served to endorse an intimate and exclusive whisky event of the highest quality, rapidly establishing itself as a must-attend fixture in any collector’s calendar.